(Nanowerk News) The reason for this focused attention is their suitability for single-molecule sensing, arising from the intrinsically nanoscopic sensing volume and the high sensitivity to the local environment. Usually the metals used to build such nanoantennas are gold or silver. To couple light effectively into localized plasmons with ferromagnetic metals like nickel or cobalt was for a long time considered in practice impossible. Few years ago a collaboration between the nanomagnetism and nanooptics groups in nanoGUNE demonstrated that ferromagnetic nanoantennas support localized plasmons, and, at the same time, show a sizeable magneto-optical activity under the application of external magnetic fields. The idea of bringing light and magnetism together at the nanoscale using plasmons led, in the past decade, to the rapidly developing field of magnetoplasmonics to realize novel and unexpected phenomena and functionalities for the manipulation of light and/or spin states at the nanoscale. Now, a team of researchers from CIC nanoGUNE, in collaboration with researchers from Chalmers University of Technology and Gothenburg University, have discovered a new way of optical sensing, using the magneto-optical Kerr and Faraday effects in ferromagnetic nanoantennas. They have recently shown in a work published in Nature Communications ("Ultrasensitive and label-free molecular-level detection enabled by light phase control in magnetoplasmonic nanoantennas") how designed phase compensation in the electromagnetic response of magnetoplasmonic nanostructures enables them to act as ultrasensitive label-free molecular-level sensors with high figures of merit, viz. great sensing performances with extraordinary signal to noise ratio. 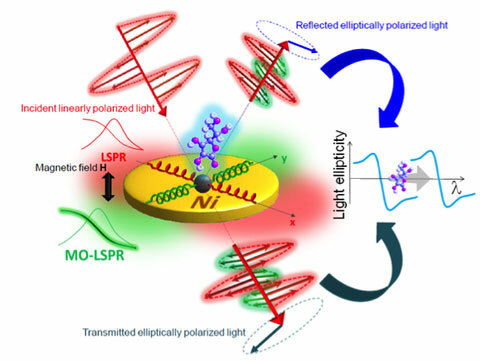 Light polarization manipulation enabled by phase compensation in the electric response of a magneto-plasmonic nanoantenna controlled through precise design of the LPRS resonance induced by the magneto-optical activity (MO-LSPR) of the ferromagnetic constituent material (Ni) and exploitation of the effect for ultrasensitive molecular sensing. Most remarkably, they have shown a raw surface sensitivity (that is, without applying any fitting procedures) of two orders of magnitude higher than the current values reported for nanoplasmonic sensors. Such sensitivity corresponds to a mass of 0.8 ag per nanoantenna of polyamide-6.6, which is representative for a large variety of polymers, peptides, and proteins. This proof of concept opens the pathway for the designing of a new type of practical devices, which can be magnetically activated and controlled to achieve very high sensing performances up to a sub-molecular-level. The discovery of these ultrasensitive capabilities is primarily directed towards biomedicine and diagnostics as an efficient way to retrieve more information from smaller amount of fluids, like blood or urine as well as to detect cancer serum or to study proteins dynamics upon surface functionalization. In addition to biosensing, there are also many other potential applications that do not require surface functionalization and would enormously benefit from this novel approach, like chemical sensing of toxic materials and explosives, or ultra-precise thickness-monitoring applications. The experiments were carried out in nanoGUNE and are the results of a synergistic collaboration between the Nanomagnetism and Nanomaterials groups.